I wouldn’t be surprised if you haven’t heard about Buffer, the social media streamlining app, as there are a fair few out there, with each presented as the second coming in the social media world. Of course, with the increase in social media outlets comes the inevitable addition of aggregation, management and analytics apps, but not all are created equal. After a little time with Buffer (and a few abortive attempts with other social media management apps), I’ve come to the conclusion that Buffer offers the best all-round versatility ease of use. In short, I love it! Basically, Buffer acts as an intermediary between the media you use (business or personal) and your social media channels, but offers a genuinely common-sense approach to your needs. In essence, it simply staggers your posts so you’re never committing the cardinal sin of over-posting on any social media platform. Looking at it from a business point of view, it’s easy to get overexcited with a new product, service or social media campaign; spamming Facebook or Twitter with your news is the quickest way to lose friends and followers, so for this reason alone Buffer is a fantastic tool for any business. One of the best things about this core feature is that you don’t even have to manually set the release times – it does it all for you. Another surprisingly useful feature is the ability to link multiple accounts to your Buffer, as well as multiple users to one account. While this may not seem like the kind of game-changing feature you might expect, it’s remarkable how versatile this makes the app. For social media managers, consultants or anyone that finds it likely they’ll stumble across a variety of media that is appropriate to varying elements of their life, this can be an absolute godsend. Think of it as a social media PA that never takes a lunch break and puts your info exactly where you tell it to. The analytics feature is also a great, easy-to-use and cleverly thought out element. Business users will likely have their own metrics and analytics tools, but as a snapshot, Buffer serves Twitter and Facebook wonderfully, allowing you to get a quick impression of interaction on your posts. Then there’s the astonishing suite of extras and extensions. These include things like Social Bro, which allows you to easily identify the best times to Tweet, along with a string of readers and feed aggregation tools to filter the most appropriate news and media to whichever device you’re using. 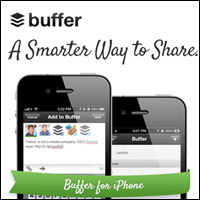 What really makes Buffer stand out is its common-sense approach to social media. It can be easily tweaked and enhanced to offer as complete a service to business users as personal socia-holics, and with a focus on functionality and versatility over high-concept features, it’s a hardworking, easygoing social media buddy.